Colore nero lucido esclusivo Montblanc. Fodera jacquard con logo Montblanc. Logo Montblanc finitura palladio. Colour unique Montblanc deep shine. Montblanc emblem with palladium-. WARRANTY MONTBLANC. Black / Leather. Junk Junk condition, in need of repair. Card pocket 4. SKU Number( 100 ). There is a sense of overall use, there is a dirt. Serial Number. C There is a sense of overall use, there is a noticeable dirt. Ident : 118311. Ident No. : 118311. - deve essere restituito nella custodia e nell'imballo originale, con libretto di istruzioni e certificati. IDEALE PER REGALI A SORPRESA. Corriere GLS. Spediamo in tutta Italia con. IDENT NR 106653. Emblema Montblanc con palladio. - non deve essere mai stato usato, non deve essere danneggiato, né sporco. - deve essere restituito nella custodia e nell'imballo originale, con libretto di istruzioni e certificati. GIOIELLERIA DIBLASI. AGGIUNGETECI TRA I VOSTRI RIVENDITORI PREFERITI. DATE UN'OCCHIATA ALLE NOSTRE INSERZIONI. Lunedì - SABATO 09.00 - 12.30/16.00-20.00. Orari di lavoro. Para cualquier información, aclaración estamos a su disposición! MPN Non applicabile. EAN Non applicabile. Materiale Pelle. Colore principale Nero. bancario bonifico. I always travel with it. Fitting / Emblem: Montblanc emblem with palladium-coated ring. AGGIUNGETECI TRA I VOSTRI RIVENDITORI PREFERITI. DATE UN'OCCHIATA ALLE NOSTRE INSERZIONI. Lunedì - SABATO 09.00 - 12.30/16.00-20.00. Orari di lavoro. DIRITTO DI RECESSO - RIGHT OF WITHDRAWAL. 37122 Verona. Circonvallazione Raggio di Sole, 7/b. Andrea Amighini & Co - La Clexidra. The Montblanc Sartorial Collection speaks the language of modern elegance. 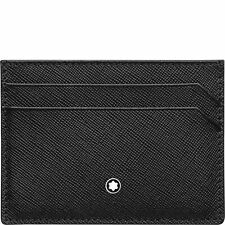 With its iconic Saffiano leather print and its unique bicolor combination - black outside and indigo inside - the passport holder has a simple and elegant design and features 1 pocket suitable for all international passports and 3 slots for credit cards. Product Information Passport Holder made of leather in subtle woven carbon look, cotton lining and Montblanc emblem with ruthenium-coated ring ---Woven Leather ---Color Black ---Interior Organization: Pocket suitable for all international passports, 3 pockets for credit cards, additional pocket ---Dimensions: 10 x 14 cm. Marchio: Montblanc. 4 SCOMPARTI. Orari di lavoro AGGIUNGETECI TRA I VOSTRI RIVENDITORI PREFERITI. DATE UN'OCCHIATA ALLE NOSTRE INSERZIONI. Lunedì - SABATO 09.00 - 12.30/16.00-20.00. Materiale: Pelle nero. Ident No: 116318. The Passport Holder features a simple and elegant design which spotlights the original combination of black printed leather, blue plain leather and blue lining. It features 1 pocket suitable for all international passports and 3 pockets for credit cards. Product Information Business card holder, made of Italian full-grain calfskin, jacquard lining with Montblanc brand name, Montblanc emblem with palladium-coated ring. ---Ident No: 113223 ---Colour: Black ---Interior Organisation: Compartment for business cards, 2 pockets for credit cards, additional pocket, back pocket ---Dimensions: 7 x 10.5 cm. 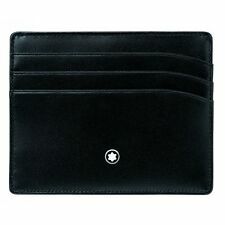 A Montblanc Nightflight passport holder made of black nylon fabric and soft black leather. Never had a chance to use it. As shown in pictures. Colore: Bordeaux. - non deve essere mai stato usato, non deve essere danneggiato, né sporco. - deve essere restituito nella custodia e nell'imballo originale, con libretto di istruzioni e certificati. The new line is crafted with a soft, slightly grainy leather, with a hand-painted cloudy-color effect. Object could be not available in case of NEW with standard MB box and Papers. New, Never Sold, Used or Inked; Perfect Conditions. Pelle: Vacchetta pieno fiore proveniente dall'Italia, nero lucido esclusivo Montblanc, concia al cromo, tintura passante. Fodera: Fodera jacquard con logo Montblanc. Finiture / Emblema: Emblema Montblanc con anello finitura palladio. Ident Number: 112341. Just Cavalli. Replacing & Withdrawal. Color: Blue. 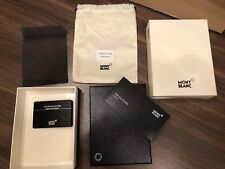 Montblanc 5527 Meisterstuck Black Leather Multi Credit Card Case - NEW! LOOK!! If you have less than. Many other pens coming soon, ask for specific one. Pocket 4cc with ID CARD HOLDER. Removable view pocket for ID card. New, Never Sold, Used or Inked; Perfect Conditions. Object could be not available in case of NEW with standard MB box and Papers. ASK FOR MORE PICTURES OR INFO. Non utilizziamo altri corrieri. Type: Credit Card Holder. Money Clip: Yes.